WHO'S THE ULTIMATE RETRO CHAMPION? We found out who was the best at Punch-Out! !, F-Zero, Sonic the Hedgehog, and DuckTales last year. Then we crowned our first Retro Champion via Nintendo World Championships on Free Comic Book Day. And now, we’re doing it again! 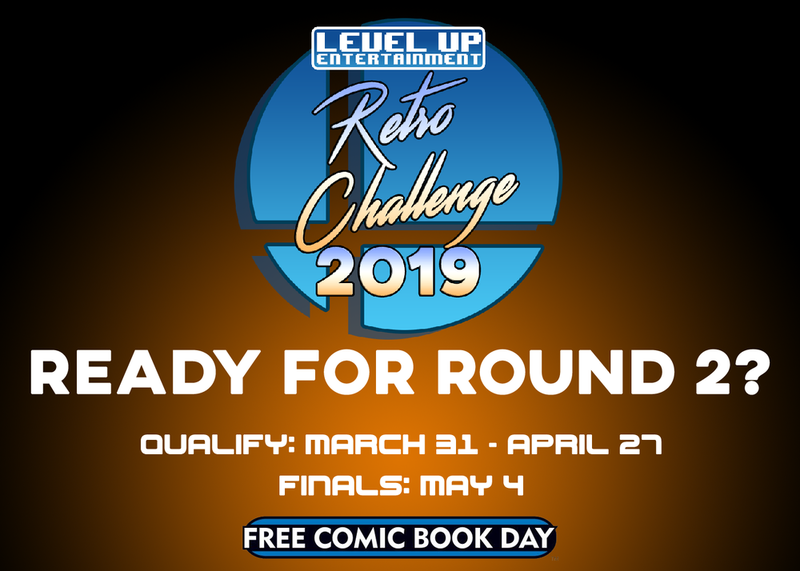 Each week in April, participate in a different challenge at Level Up Entertainment. The top player from each challenge will then go head-to-head on the main stage at Free Comic Book Day! Think you've got the skills, the smarts, and the guts to face the challenge and become the ultimate retro champion? Each player may only enter once per challenge. Make sure you practice ahead of time! You'll be able to play each challenge during it's specific week and during specific store hours ((Sunday: 1PM-5PM, Monday through Saturday: 4PM-8PM). Plan ahead! A game over will disqualify you from that challenge. Don't die! If you win a challenge, you must participate in the finals on Free Comic Book Day for your prizes! It's an amazing show you shouldn't miss anyway! Read the full rules here!